This historical fiction children’s book is a sequel to Island of Blue Dolphins. I think it is essential to read the first book before this one. Part of this children’s book provides a glimpse into what happened to Karana after she moved from the Island. 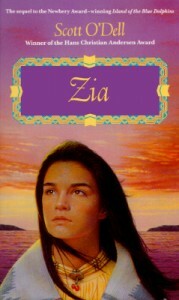 However, that is actually only a small portion of the book, since her life after leaving the island was tragically short. The majority of the book is a chilling depiction of the treatment of the Native American Indian population during the time of the California missions (1769-1821). This is not an easy children’s book to read. It is pretty sobering, from start to finish. However, it is an important part of our history. I would use this book in a classroom or homeschool setting, for 6th grade and up. It will facilitate a discussion on an important part of our past, particularly in California. I would like to acknowledge the writing skill of Scott O’Dell. The language is very straightforward, as if we are listening to language in translation, so it creates a flavor of a distant time. In addition, the final ending offers a spark of light in an otherwise sad story.